Amendment to the Rule 152 of General Financial Rules, 2017 – Reg. : Departement of Expendiure OM. 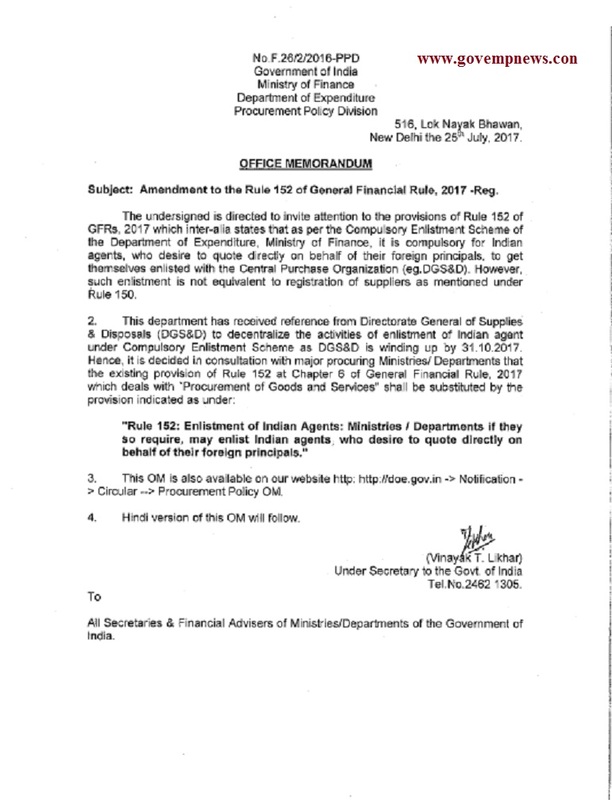 Dated 25th July 2017 ** No.F.26/2/2016-PPD, Government of India, Ministry of Finance, Department of Expenditure, Procurement Policy Division ** 516, Lok Nayak Bhawan, New Delhi the 25th July, 2017 ** OFFICE MEMORANDUM ** Subject: Amendment to the Rule 152 of General Financial Rule, 2017 -Reg. Subject: Amendment to the Rule 152 of General Financial Rule, 2017 -Reg. 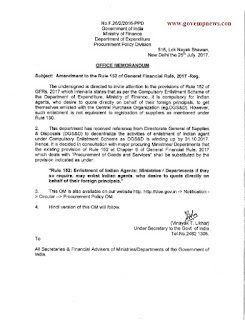 The undersigned is directed to invite attention to the provisions of Rule 152 of GFRs, 2017 which inter-alia states that as per the Compulsory Enlistment Scheme of the Department of Expenditure, Ministry of Finance, it is compulsory for Indian agents, who desire to quote directly on behalf of their foreign principals, to get themselves enlisted with the Central Purchase Organization (eg. DGS&D). However, such enlistment is not equivalent to registration of suppliers as mentioned under Rule 150. &nbsp “Rule 152: Enlistment of Indian Agents: Ministries / Departments if they so require, may enlist Indian agents who desire to quote directly on behalf of their foreign principals." 3. 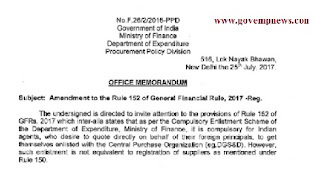 This OM is also available on our website http: http:/doe.govin ~> Notification>Circular --> Procurement Policy OM. 4. Hindi version of this OM will follow. All Secretaries & Financial Advisers of Ministries/Departments of the Government of India.